Comfee Stainless Steel Temperature preset kettle, Smart and Temperature adjustable, choose it and start to make your wonderful morning drinks! Cool-Touch Handle with Digital LED Display : With advanced Strix Temperature Controller, LED display digital panel and cool touch handle, which make a smart electric hot water kettle for you. Temperature Preset Adjustable: Temperature adjustable from 120°F to 212°F/48°C~100°C, you can set precise temperature for different kinds of drinks, milk, tea, coffee, cocoa, ect. Powerful with Boil Dry Protection: 1500 Watt fast boiler with Auto shut off and boil dry protection for high safety; 1.7 liter large capacity, and filling water DO NOT exceed this maximum water level. 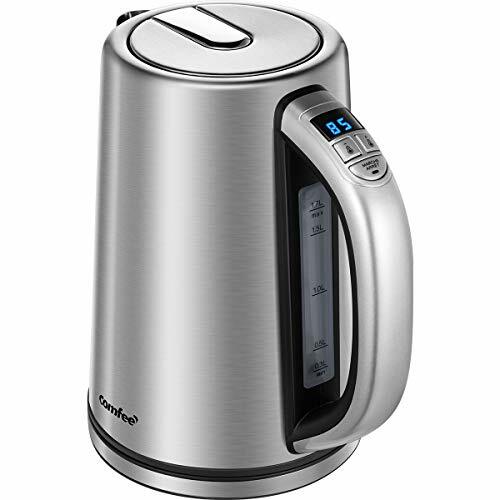 Bonus features Including: Brushed stainless steel kettle gives a clean and modern out shape; Water level window on the side; Removable spout filter inside; Stainless steel pop up lid. High Quality and Warranty: UL certified, BPA-Free material and superior craftsmanship ensure solid quality of the kettle. And we offer 1 year warranty. If you have any question, please contact us!